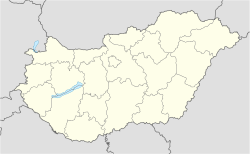 Ecser (pronounced [ˈɛʧɛr], approximately "acher") has also a Slovakian name: Ečer, and it has Slovakian minority. It is situated southeast from Budapest, near the Ferihegy International Airport. The neighbour settlements are Maglód, Vecsés, Gyömrő and Üllő. The motorway M0 leads near the village. The village is situated on the railway-line 120a (Budapest-Újszász-Szolnok). The first written memory of Ecser is from December 15 1315, although the village existed already from 896, when the Hungarians arrived into their nowadays country. According to a legend, the name of the village is arisen by Grand Prince Árpád of the Hungarian tribes. When he asked about the name of the settlement, where he stopped to have a luittle rest, the local people could not tell him the name, so Árpád said them: call this place after this oak (Hungarian cser). During the Turkish (Ottoman) Dominance (1526-1686) the village died out, mainly after the siege of Buda, which was near. The first inhabitants arrived back only in 1699. In Rákóczi's War for Independence (1703-1711) there were 11 soldiers from Ecser. In the early 1700s years the owner of the village, Count Antal Grassalkovich settled in Slovakians. The only monument in the village is the Roman Catholic church from 1740. In the village there is a world famous folk dance called Wedding at Ecser (Ecseri lakodalmas). On the coat of arms is seen the church, the folk dance and the oak tree, the three most important sign of the village. This page was last edited on २ जुलाई २०१४, at ०४:१८.